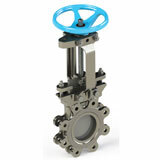 The figure 6500 is an all cast stainless steel body and yoke with investment cast packing follower. It is designed for the pulp and paper, chemical, mining, power, petroleum, and food process industries, as well as municipal water and waste treatment plants. It is ideal for handling dense mixtures of stock and slurries with unidirectional shut-off. The shearing action of the knife gate cuts through solids and cleans the seat as it closes. Available in sizes 2" to 24"